March 30, 2015 In News What is Michelle doing now? A photo collage of the Principal Madrid, Spain. 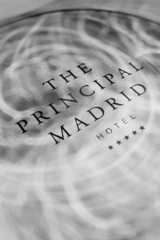 Michelle stayed at the brand-new Principal Madrid, and was wowed by the portraits, the white-gloved porters and the branded goodies in this centrally-located luxury hotel.She loved the fabulous city views of the Spanish capital, both from her room, and the vantage point on the rooftop terrace with restaurant, bar and chill-out lounge. For more click here. 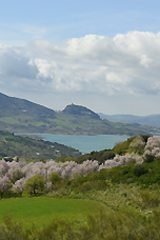 Trees in blossom in Zahara de la Sierra. Spring is in the air, and late February/early March is the time for the almond blossom to come out – the first sign of spring, which makes for spectacular photos. Michelle concentrated on the area of Zahara de la Sierra, revisiting one of the most spectacular villages in Andalucía. All hotels, even old ones, should renew their imagery on a regular basis – Michelle gives 10 reasons why this is the case in a post on her Hotel Essence Photography website, including travel websites’ guidelines, quantity of images provided, social media, quality of imagery, visual storytelling, and iconic features and anecdotes. Michelle attended a very interesting lecture by Tete Alverezat the CAC (Centro de Arte Contemporaneo) in Malaga, organized byEduardo d´Acosta. Alverez is visual artist from Cadiz who works with the medium of still photography, video and installations. In the journey of photography, the more works we see, the more inspiration we have.Michelle believes that even if you pick up just one point of technique from attending such a talk, it’s worth going to add this valuable skill or tipto your wealth of photography knowledge. Also, it’s fascinating how each photographer has his or her own take anygiven subject. 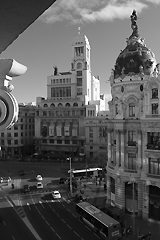 Wonderful views of Madrid from its newest five-star hotel. Beautiful touches at the Principal Madrid. 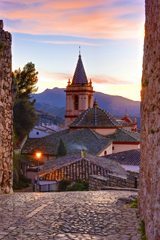 The picuresque town of Zahara de la Sierra.